Take any idea of what you think is a tiny pen and throw it out the window. 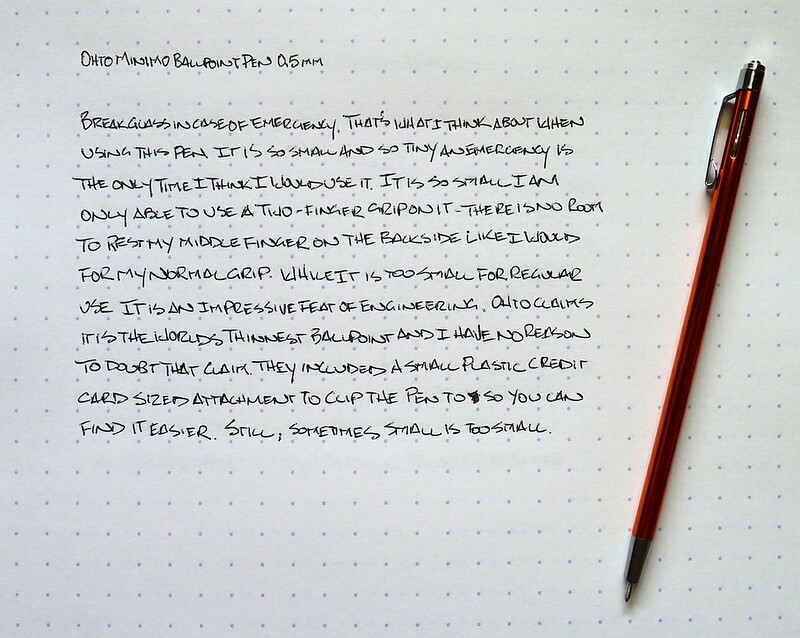 The Ohto Minimo Ballpoint trumps them all, even claiming it is the world's thinnest ballpoint. After using it I have no disagreement with that statement. This is the first mini pen I have used where I couldn't use my normal tripod-style grip (index finger and thumb on front, backed by my middle finger). It has been close with other pens like the Zebra T3 but I could always get there. 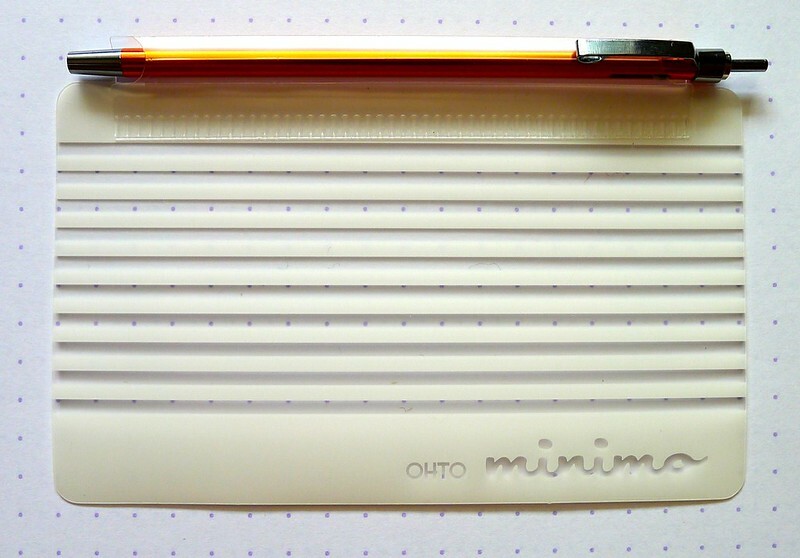 With the Ohto Minimo I could only grip it between my thumb and index finger to write with. This was a problem at first but I adjusted quickly and got decent writing performance. 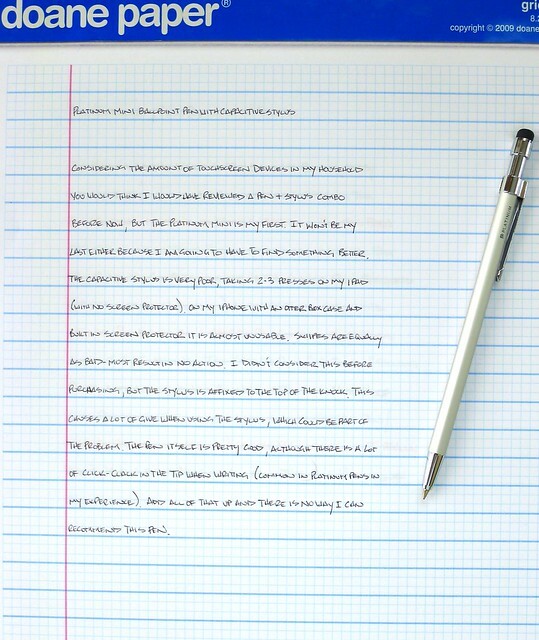 With a pen this small comfort isn't necessarily the priority - vanishing into any notebook, pocket, or purse is. In fact, Ohto packaged this pen with its own credit card sized holder so you can keep tabs on it. That's a hint folks. The Minimo is too small for me to get any regular use out of. My choices in the mini pen arena are downright gargantuan comparitively, but I'll stick with the Monteverde Poquito or the Pentel Slicci Techo for my mini needs. 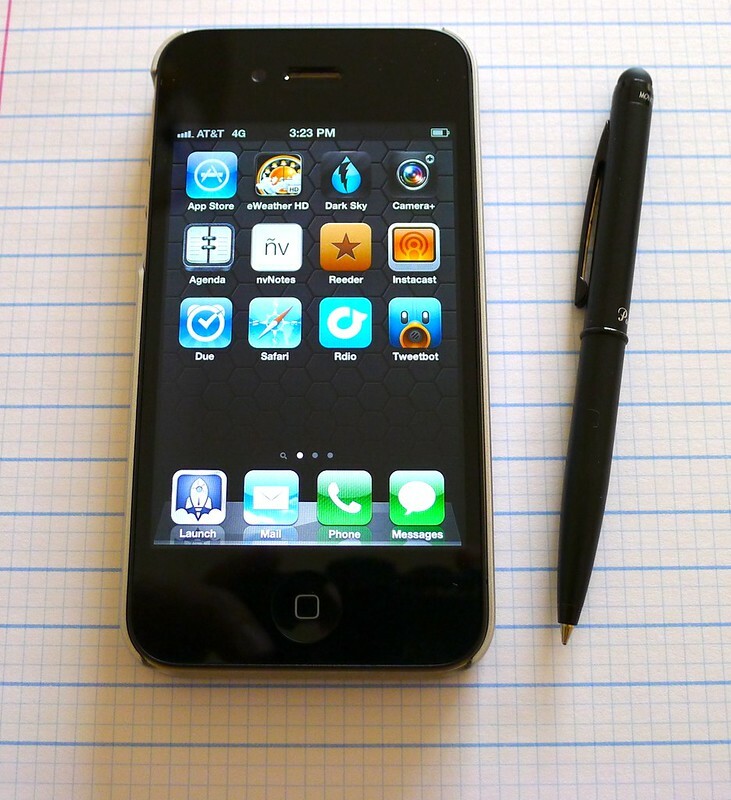 Posted on September 20, 2013 by Brad Dowdy and filed under Mini, Pen Reviews, Ohto. I mentioned in last week’s podcast that I had tried out a new pen + stylus combo that I did not like, and the Platinum Mini Ballpoint Pen with Capacitive Stylus is the guilty party. The concept is good, but there are just too many flaws to make this a pen worth using. To cut right to the chase, my main issue is the stylus performance. First off, it is very non-responsive on my touch screen devices. It took 2–3 taps to register on my iPad without a screen protector and 3–5 taps on my iPhone with an Otter Box built in screen protector. Swiping? Don’t even ask. Secondly, and possibly the cause of the first issue, is that the stylus is on top of the pen knock. I didn’t give it a passing thought when ordering the pen, but the knock spring is not strong enough to prevent the stylus from receding a large amount when trying to use it. It is like squish, squish, squish every tap. It was frustrating after about five seconds of use. The pen itself is not so bad. The slim design is great for portability, and the 0.5 mm ballpoint writes very well. It’s a shame that the stylus performance is not up to par. I think JetPens agrees - I have never seen a pen move from New Arrivals to Close-Out so quickly. 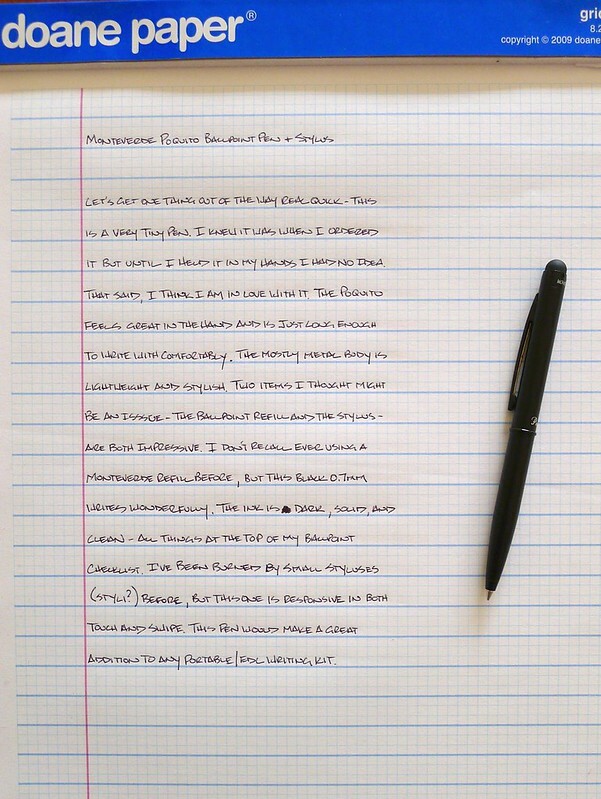 Posted on July 16, 2012 by Brad Dowdy and filed under Mini, Pen Reviews, Platinum.